We offer a range of accommodation from single rooms, double rooms, twin and family rooms. Each room has tea and coffee making facilities as standard as well as a hair dryer, direct dial telephone and Digital Television. As well as accommodation and meals, we also provide wireless broadband internet access. Should you wish to bring your wireless enabled laptop along for your journey you may use our broadband internet connection free of charge. 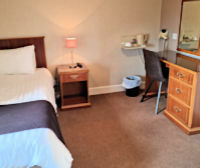 All rooms have tea/coffee making facilities, hairdryer, Sky/Freeview TV.